It has been a while since my wife and I have had to buy a printer. But about 3 weeks ago ours stopped working and we were forced to look for a new one. 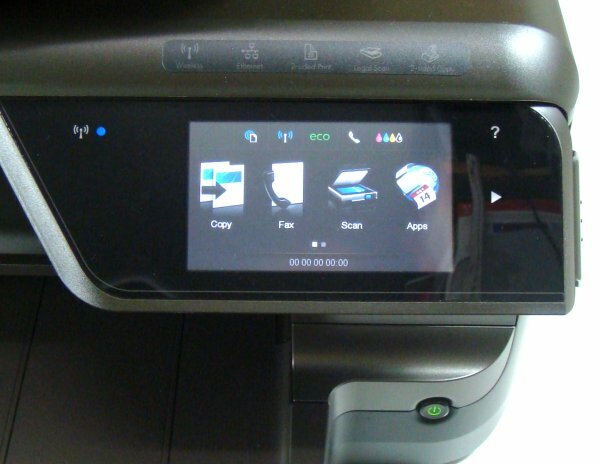 Through much research we settled on the “HP Officejet Pro 8600 Plus e-All-in-One printer.copier” why? Well we had a few requirements. 2. It had to print more than 100 copies on one print cartridge. Our last one struggled to make it to that number and we were looking to cut cost on ink cartridges. 3. Price had to be what we could afford… of course that goes without saying. So we looked and looked and looked (because my wife likes to shop… and look) and found a printer that met all those requirements and to boot we found it for half price on Amazon.com with free shipping! Yesterday it arrived and I was shocked with what we had actually purchased. 2. You can print from anywhere to it. It has it’s own email address and you can send it (the printer) an email and it will print that email once it receives it. 3. It has a touch pad… yes a touch pad with apps. 5. Did I mention it has a touch pad with apps? There are several things you can do with these. For example it has an app for The New York Times, and you can schedule it to print the New York Times everyday, right there on your printer… and its free…. except of course the ink you would use… the wear and tear on your printer… and the paper it would use to print it. There is a daily paper airplane app that you can use to schedule it to print daily a full color paper airplane pattern for your kids to make each day… and it’s free… except of course the ink you would use… the wear and tear on your printer… and the paper it would use to print it. And there are plenty more apps you can use both for adults and children. but I do expect it to transform into a robot at any moment that cleans our house then transforms back into the printer just in time to print the news paper for us the next morning.